Lots of questions, but no real answers. 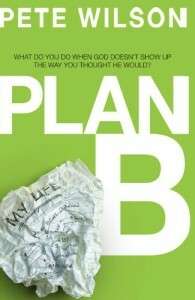 Basically this book gave a lot of examples of situations where people were forced into a Plan B, and then related their responses to it. But the only answer offered to the subject question is "Trust" ... and perhaps "Hope". Both true answers to be sure, but nothing I wasn't aware of already.But to be fair, I don't exactly now what other kind of answer I was looking for... possibly just some more concrete examples of how to trust in God. Rather than just offering the platitude of "Let God be the editor of your life" (which doesn't even make much sense to me), I'd like specific instructions of how one goes about doing that. Probably impossible to give, as they're bound to differ from person to person, but in that case, just some examples of how real-life people set out to do it.Unfortunately that's my problem with many Christian self-help books.